Officials at the Council on American-Islamic Relations (CAIR) have expressed astonishment and confusion over a decision by the United Arab Emirates to include the American-Islamist organization on a list of terrorist groups. "Well this is shocking to us in the first place," CAIR co-founder and Executive Director Nihad Awad told CNN Tuesday. "It's a bizarre move by the UAE and that's why we're seeking clarification by this decision, not only CAIR but other civil Muslim organizations including Muslim American Society and the largest Islamic relief organization for Muslims in the West. So it is quite frightening and shocking that a state like the UAE would designate an American civil rights and advocacy organization like CAIR." The terrorist list was first reported by Buzzfeed on Saturday, which cited a UAE state media announcement. 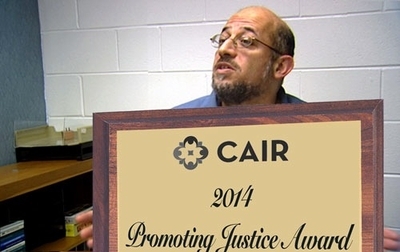 One week earlier, a CAIR banquet in California bestowed its "Promoting Justice" award to Sami Al-Arian and his family. Al-Arian was on the Palestinian Islamic Jihad's Shura Council – its board of directors – in the 1990s and provided refuge to at least three other board members in the United States, including current PIJ Secretary General Ramadan Shallah. During a later fundraising session, Damra urged the audience to give to the Islamic Jihad, invoking a recent attack by one of its members. "And whoever wants to write a check," Damra said, "he can write it in the name if the Islamic Committee for Palestine, 'ICP' for short." Four years later, in the wake of a double-suicide bombing in Israel that killed 21 Israelis, Al-Arian wrote a letter to a Kuwaiti legislator seeking money "for the jihad effort in Palestine so that operations such as these can continue..."
Al-Arian has claimed that the letter was never sent. But it was handwritten in Arabic and signed, and a copy was kept in his home, where federal agents found it during a November 1995 search. "The evidence was clear in this case that you were a leader of the Palestinian Islamic Jihad," U.S. District Court Judge James Moody told Al-Arian during a 2006 sentencing hearing. "You were on the board of directors and an officer, the secretary. Directors control the actions of an organization, even the PIJ; and you were an active leader." Al-Arian pleaded guilty to conspiring to provide goods or services to the PIJ. His plea agreement included an admission that he was associated with the PIJ. But he has never acknowledged the depth of his involvement, and certainly never disavowed the group's bylaws, which were found in his home and call for: "The rejection of any peaceful solution for the Palestinian Cause, and the affirmation of the jihad solution and the martyrdom style as the only option for liberation." The bylaws include a goal of creating "a state of terror, instability and panic in the souls of Zionists and especially the groups of settlers, and force them to leave their houses." CAIR officials know all of this. They have stood by Al-Arian's side for nearly two decades possessing that knowledge. They also know his plea agreement includes his agreement to be deported. In introducing the award Nov. 8, CAIR San Francisco Vice President Maleeha Haq explained that "the Al-Arian family was a natural choice. For over 11 years now they have been at the center of an unjust campaign by the government. Alhamdulillah, the government decided to finally dismiss all of their unfounded charges against Dr. Sami Al-Arian. However, he remains in limbo awaiting deportation proceedings." Al-Arian thanked CAIR for the award and challenged the audience to fight against law enforcement sting operations, which he said unfairly target and entrap Muslims. "But the only way to stop it... is through a public organization campaign to change the government," Al-Arian said in a video message. "Brothers and sisters, our young men should not be sacrificed at the altar of Islamophobia or a fake war on terror. Our people should not be targeted because of their beliefs or associations. We should say no to thought crimes, no to preempted or pre-crime prosecutions ... This is a crisis that our community has been ignoring for so long, and we must face up to this challenge. Brothers and sisters, ladies and gentlemen – if not you, then who? If not now, when?" Awad, the CAIR national executive director, also spoke during the banquet at the Santa Clara Convention Center. Despite consistent FBI data showing hate crimes against Muslims remain relatively steady, and far less of a problem those targeting Jews, blacks and gays, Awad had a dire warning for his audience. "Islamophobia is a national crisis for the Muslim community," he said. "Islamophobia is an existential threat to the presence and the future of Islam and the future, and the freedom of religion for Muslims in this country." The terrorist designation by the UAE, a Muslim nation, wouldn't be announced for another week. The designation reportedly stems from CAIR's connections with the Egyptian Muslim Brotherhood. In his CNN appearance Tuesday, Awad dismissed that as a fantasy. "We were never linked to the Muslim Brotherhood," he insisted. "We are not. We are an independent American organization. But guilt by association should not just be taken easily by these governments." Internal Muslim Brotherhood documents tell a different story. They place Awad individually and CAIR as an organization inside a Brotherhood-created Hamas support network in the United States that was called the Palestine Committee. Awad participated in a secret 1993 Palestine Committee strategy session in Philadelphia called to devise ways to "derail" the new U.S.-brokered Oslo peace initiative without exposing themselves as Hamas supporters. Awad even referred to Hamas in the code name organizers instructed, reversing the spelling and calling it "Samah." Those connections were enough to prompt the FBI to cut off all outreach communication with CAIR in 2008. A federal judge determined there was "ample evidence to establish" a connection between CAIR and the Muslim Brotherhood's Palestinian offshoot Hamas. At the banquet, Awad acknowledged the contributions to CAIR by co-founder and former national chairman Omar Ahmad, described by an FBI agent as "a leader within the Palestine Committee." The UAE's terror designation doesn't mean CAIR is actively plotting attacks. But as we have repeatedly demonstrated, it has no problem standing by those who enable terrorism through fundraising, propaganda and more. People like Al-Arian, or the Holy Land Foundation leadership, or convicted Palestinian bomber Rasmieh Odeh. CAIR's timing, awarding a PIJ director just before the UAE labeled CAIR as terrorists, doesn't do much to bolster CAIR's complaints that it is being unjustly tarnished. If the Palestinian are terrorist for fighting occupation and ethnic cleansing, then George Washington, Benjamin Franklin, Charles Cornwallis, heck all of them are terrorist for fighting the Brits. Dr. Al-Arian was misquoted in the article. He was actually quoting a constitutional scholar commenting on the practice of entrapment by the government. Here is what the recording said: "But the only way to stop it, he says, is through a public mobilization campaign that shames the government." See here, here, here and here. The "shocked denial" by CAIR's leadership concerning the UAE's designation of their organization appears to be full bore taqiyya in action.